Major refresh that debuted in 2013. New anchor desk island, smaller and more intimate than the previous desk. New murals in side windows. Montage composed by KCNC-TV Graphics team. New stand-up position with 90” monitor on right side. New stand-up position with 60” touch screen monitor on left. New multi-purpose set used for talk, specials and sports. 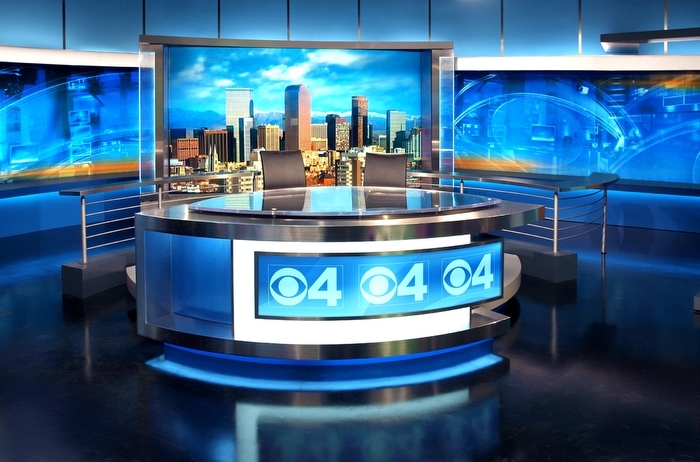 The process involved completely dismantling the existing news set and moving it out of the studio for modifications. 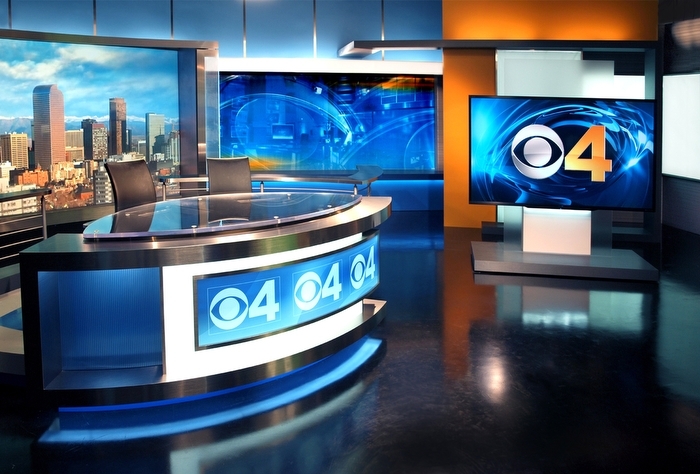 During this time KCNC-TV had the studio floor refinished and polished. BDI re-purposed numerous of the existing set low walls, valances and headers, while building new pieces throughout the set to improve the shooting geometry and layout of the set and interaction shots. 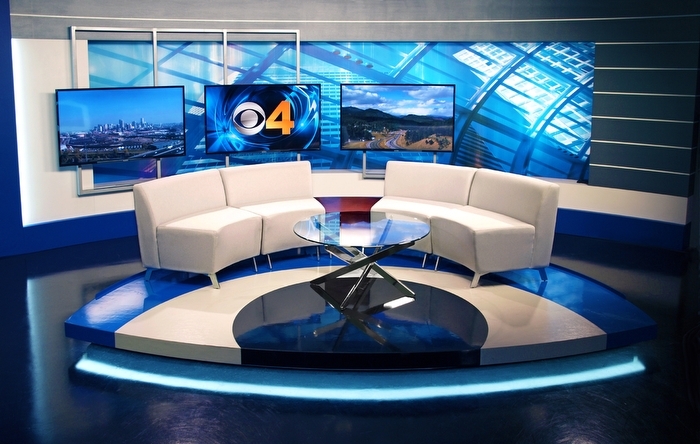 Prior to the studio work commencing, BDI sent our Lead Install Tech to the KCNC-TV studios to precisely field measure all the existing set pieces that would be tied into new set pieces. This allowed our shop to perfectly marry the new to the old elements. The result is we freed up significant floor space and created better shooting angles and more exciting Stand-up venues. 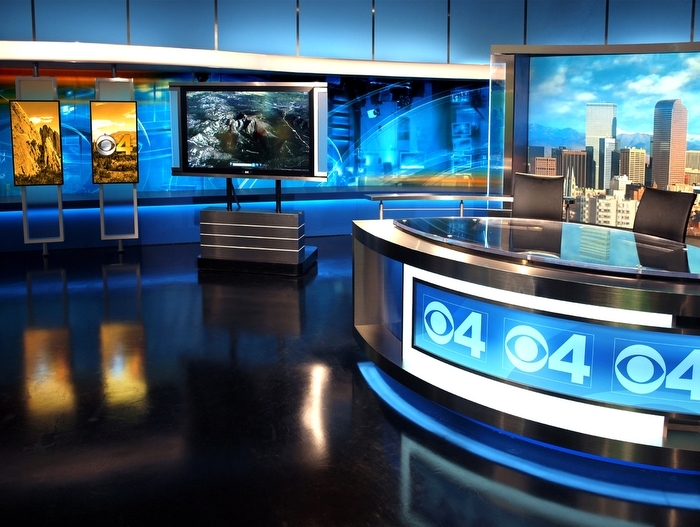 The color scheme of the set materials were chosen to complement the new blue and white CBS graphics package.